Wellesse Glucosamine Chondroitin Liquid Supplement is a joint health supplement product that combines the strength of the most powerful ingredients known and clinically tested for relieving pain in the joints and helping the cartilage repair. Delivered in liquid form, it is also said to be easily absorbed by the body, compared to pills and capsules. It must also be noted that the product enjoys a great number of positive reviews, which means that many people find it useful for treating their joint pains. A closer look to the ingredients will be helpful to make an informed choice when you want to pick up a health supplement for diminishing the pains and lack of flexibility in your joints. These four ingredients are very effective in relieving joint pains and helping cartilage rebuild. Glucosamine, chondroitin and MSM were clinically tested, and especially the combination of the three leads to great results. Since Wellesse Glucosamine Chondroitin Liquid Supplement also contains hyaluronic acid, necessary for improving the liquid present in the cartilage, we can safely say that this is a great product. 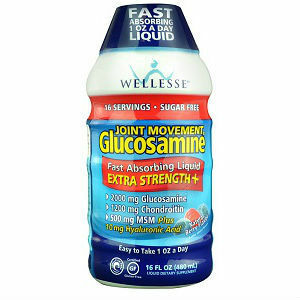 Since Wellesse Glucosamine Chondroitin Liquid Supplement is delivered in liquid form, the recommended daily dosage is 1 oz. A bottle with 34 servings has a listing price of 37.98USD and it lasts for about a month, so the product is decently priced. No clear guarantee is offered on the manufacturer’s website, so you may have to rely on resellers and their refund policies. However, you can contact the company over the phone or using the online form offered on the official website. Wellesse Glucosamine Chondroitin Liquid Supplement sounds like a great product, making it easy to take for those who are not crazy about taking pills. It has all the right ingredients, in important amounts, so it may work as intended, especially since there are plenty of people satisfied with the results. However, we notice that the product does not contain any herbal remedies, which is a drawback, since they could contribute to the healing effect. Mark Stevens	reviewed Wellesse Glucosamine Chondroitin	on September 19th	 and gave it a rating of 3.5.